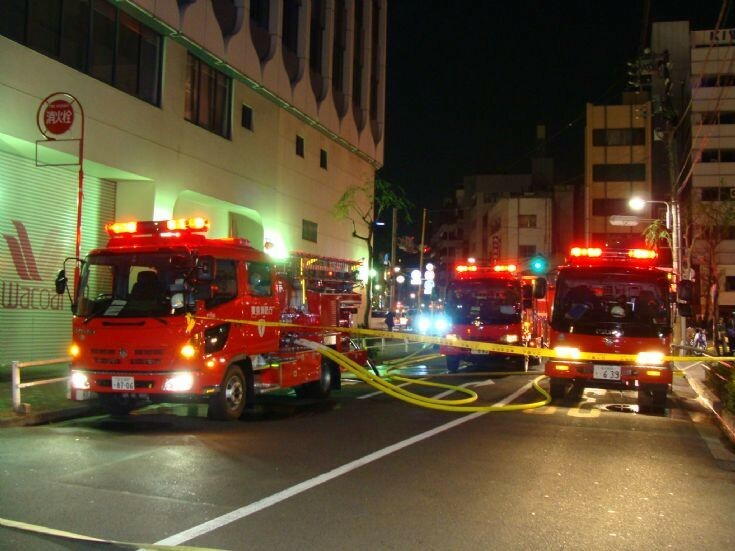 The pumper is right on top of the hydrant, using suction hose to set in, which is common practice in Japan. The black and white rear mounted pre-connected suction hose is just visible behind the pumper. The tall round red sign indicates the hydrant location - standard everywhere in Japan and just possibly the most conspicuous way of showing a hydrant location anywhere! One reason suctions are used is that in some areas there are no hydrants and water is supplied from underground cisterns, so all pumpers have to be ready to pump out their supply. Used with a hydrant, the larger diameter of the suction permits a higher flow volume than one or two regular 65 mm hoses would.